I can not choose scanning options because is Sybase? In "Search Results", I can save and print, but how can I generate a report? Clicking on a name in a table, I can see the first 1000 records, how can I see the following records? and how I can generate a report to print of this? You are correct. Not all scanning options are supported by Sybase, such as these that require use or standard regular expressions in SQL queries. The first 1000 records represent a data sample from the table you clicked. 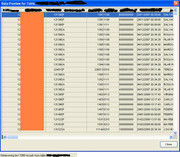 If you want to print the entire table content, you can use any database querying tool of your choice.